Please Note: All the three versions of this post, viz. Hindi, English and Hindi-English Transliteration are there in the post. The default visible script is the Hindi script in which it was originally written. To read in English or the transliteration please click on, 'Read in English', or 'Read Transliteration' respectively. If however the sections still don't become visible, the same are provided in the comments sections. Yamuna served as a natural boundary dividing Himachal and Uttarakhand when Uttarakhand state was born. On its banks, while en ‘route to Tehri region from the capital city of Dehradun is a small village. A few miles from here into the interior, Yamuna hits the plains and sheds its turbulence becoming more quiet and mellow. Primarily being an agrarian society, paddy and mustard are planted in abundance here. Despite of its proximity to the Doon valley, summers are marked by simmering heat. Literacy mission reached here long ago, but the people are still reluctant of letting go of the yoke of the traditions that they have been carrying from ages. Any talk of modernization of the methods falls on deaf ears. Still, the village is progressing, though slowly. Change takes time. The village is one of the primary suppliers of dairy products; milk primarily, to the nearby town. On the banks belonging to this village, there stands an old banyan tree, magnificent in size and age. A platform for resting has been made around the wide trunk of this tree. Panchayat sessions are convened under the shade of this tree, just like it has been since ages. The schools in the state have closed owing to summer holidays. Kesar has come to his grandma’s place along with his mother for a few days. He must have been around 10 years old, brought up in Dehradun, mischievous and full of energy. Most of the family members come to the village at this time of the year. This is how the harmonious relations are maintained in the family even though the joint family system gave way to nuclear families a long time ago. Every night after dinner, all siblings gather around their grandmother to listen stories. Grandma narrates stories taken from Panchtantra, Jataka Tales, or the tales from Indian mythology. Of all these, Kesar likes the stories of Krishna and Prahlaad in particular. ji ke bahaav ne aap hi nirdharit kar di thi. Uttarakhand ki rajdhaani Dehradun se tehri kshetra ki or jaate hue Yamuna ki teer par ek gaon hai. Yahaan se kuch mile oopar se sapaat bhoomi aarambh ho jaati hai aur paani ki gati maddham hone lagti hai. Krishi pradhan kshetra hone se, dhaan aur sarson ki bharpoor bijayi hoti hai. Bhale hi doon se sameepta ho, aur uttar ki or achal pahaad hon, garmiyon mein yahaan bhi aag barasti hai. Saaksharta ka diya prajwalit hue ab kaafi samay beet chala hai, par barson se chale aa rahe taur tareeke yakayak hi to nahi chhode jaate. Aadhunikta ka raag alaapna maano bhains kea age been bajana. Phir bhi dheere dheere yeh kshetra bhi badh raha hai. Nikat mein ek nagar hai, jahaan ke doodh ki adhikaansh jaruratein is gaon keg wale poorn karte hain. Nadi ki kagaar par ek pracheen bargad ka vriksh hai. Iske thoonth ke chaaron or ek bada sa chabootara bana hai. Panchayat ki baithakein Panchayat ghar mein na ho kar ke yahaan hoti hain, jaise ki hamesha se hoti aayi hain. Dehradun aur anya kshetron ke vidyalayon grishmkaleen avakaash ke chalet band ho chuke hain. Kesar, apni mata ke saath thode dino ke liye apne nanihaal aaya hua hai, is gaon mein. Kesar kareeb nau-dus saal ka baalak hoga. Chanchal svabhaav aur Dehradun mein pala bada. Greeshm kaal ki lambi chuttiyon mein parivaar ke sabhi jan gaon aaya karte hain. Parivar mein ekta aur sneh isi prakaar bana rehta hai, jab sab log kuch din apni vyast deencharya se nikal kar ek doosre ke saath bitate hain. kuch panchtantra se, kuch jataka sangrah se, to kuch hind aadhyatm se chuni hui. Mama aur mausi ke bachhon ke saath kesar bhi in kahaaniyon ka lutf uthata. Use sabhi kahaaniyon mein se Krishna aur prahlaad ki kahaaniyan badi rochak lagti hain. hoti hain, jaise ki hamesha se hoti aayi hain. vyast deencharya se nikal kar ek doosre ke saath bitate hain. se Krishna aur prahlaad ki kahaaniyan badi rochak lagti hain. P.S. I had been fiddling with the html code to embed all three versions in one, so the results could be nasty on different browsers. Please do bear with me, I'll revert back to original format if its too troublesome for me too. P.P.S. Maithili has awarded me with her custom made award for 'Thought provoking Blogger'. Many thanks to you, and here are the answers. The award has been added to the hall of fame. And, the award is lovely. Thank You again. 1. What is your most cherished gift? : Friends. 2. Which is your favorite color? : Black. 3. Beach or hillstation? : Hill Station. 4. Book you like to read again and again. : Not encountered any yet. 5. When is your birthday? : Last day of November. Anshul this post of yours reminds me of my summer vacation and stories that my Nani used to recite.I still remember some of them. So no comments on that part..
Writer,translation please, heard about Krishna and i liked her traits. This post must be so nice but i only knew few Hindi words.. Writer, congratulations ! it's expected for you are such a brilliant writer , an exceptional in this field! More power, move that hands always..
Hindi... :( Its a shame actually that i dont like reading it. Boo on me.. I have taught Hindi to kids and appreciate anyone who is keeping it alive in todays English speaking generation. Someone has said that truth should not come in the way of a good story. I cannot presume the adjective though, but rest of the part holds here too. Thank you, the translations and transliterations were already in place. You might have missed the links. They aren't much highlighted owing to the present theme, I understand. Well they are here now. It's strange you know. Krishna being called 'her', its quite uncommon. But Krishna was Radha once. And I think they inculcate the best virtues we could instill in a little child before he/she sleeps. You'll never know until you'd actually tried whether it was worth it or not. 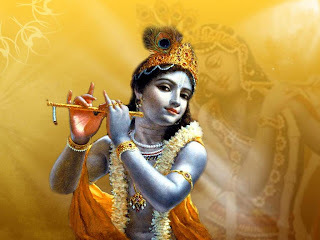 Writer ,i have interchange Krishna and Radha..sorry for that got little of Indian Literature. Genres? I never really thought about it that way. Thank you Suruchi. In spite of nuclear families the traditions and fun of enjoying together with relatives, grand ma and grand pa in summers act as the filling gap b/w nuclear and joint families. Post reminded me several holidays I had spent at my dadi'd and nani's place. I miss those days so much !!!! interesting blog... great writing.. glad to have stopped by.. I will be waiting eagerly for the continuation :) ..It is going to be interesting it seems..
Waise ye kahani kesar ki hogi ki nani ki sunayi hui ek kahani panchtantr ya jatak sangrah ya hindi adhyatma se chuni hui? Wow i just so much feel like i have been thrown back in time and waiting eagerly to read ahead.. The write-up in Hindi is damn interesting and i don't have any pains in reading and understanding it so i didn't go for the English. A slice of mythology woven in a modern day tale...very nice. Look forward to Kesar's (a name I normally associate with girls) journey. P.S I noticed how quite a few people mentioned Nani not Dadi...Are we always closer to mom's side of the family? I am lucky enough to stay with my dadi, and she still narrates me some of her childhood stories. About the name, Kesar khaaya jaata hai ya jaati hai? Actually Dadi was in the original script, but Nanihaal is a word I couln't find a suitable substitute for from the other side of the family tree. It's been a while since I last read anything in Hindi. I struggled through it. But liked what I understood. Now for the English version..
cannot wait for the next. seriously. well i m late to comment! waiting for this tale and more abt this land! Its nice to explore ur blog. Its very interesting. U r welcome on my blog also. firstly congrats on the award. it's true, you're one thought provoking blogger. I always enjoy reading your posts and the emotions your words stir inside me. will be looking forward to the continuation. That is how clear your writing is! Looking forward to read more. Take Care. Award truly deserved :) Congratulations. I will try to live up to the expectation. Are you a Saggitarian too? Yup am a Saggitarian too :D I saw it on your profile too in the beginning. This piece of writing has a certain rustic Ruskin Bond like flavor to it. Reminds me of Bibhutibhashan's Pather Panchali too in a way, the way Apu would listen to his mother reciting passages from Mahabharata! Looking forward to the other parts. Nicely described the on going evolution of rural places. reminds me of katha sagar. cherished gift: friends ! liked it. Anushul, I am glad I stopped by 'Being Krishna'.. The Other Day I stopped but I have a bad habit, If I read something I wish to read it fully, So I left the place but now after 3, I would like to share my views..
part ! ***** to you.. Awesome man.. and your translation and transliteration part is great.. Now to part 2..